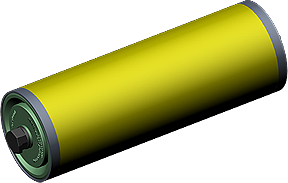 1 – Propreitary Forumlation (MSHA #IC-239/00): The titanium enriched PVC YeloRoll grabs and steers the belt the same as metal can rolls, is self-extinguishing and has 40% greater roll abrasion characteristics of HDPE. 2::1 over the metal can rolls, conductive and approved for underground use. 2 – Wash-Down Duty: During wash-down, engineered edge of the YelloRoll flinger forms a contact seal with minimal drag, stopping egress of water and solids, protecting the metric ball bearing. 3 – Engineered Surfaces:YeloRoll’s shaped flinger surfaces cut through sticky corrosive solida that build ups up on flat, smooth and uneven surfaces, offering bearing protection since 1994. 4 – Disc Brake Technology: YeloRoll’s groves prevent roll lock-up by cutting through solids, slowing and moving material away, protecting the bearings. 5 – Jammed Frozen Rollers: YeloRoll leads the industry with non-rotation, Flinger-Seal that will not slow roll rotation when material jams in between it and the frame, protecting the bearing by covering 80% of the Yelo-Roll end cap..
6 – Combi-Cap: Yelo-Roll bearings mounted over the top of the Combi-Cap rather than directly to the solid steel shaft, eliminating corrosive dielectric and creating a more robust system by reducing bearing shock and vibration. 10 – No Welded Seams: YeloRoll has presure fitted end caps rather than welded. Metal can welds will corrode and wear, thus seperating from the shell, forming pizza-style cutter, slicing belts and bringing production to a halt.